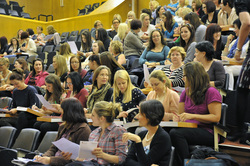 For the second year running, I've just been guest speaker for two sessions at the Annual Midwifery Conference in Hull. This year I ran sessions on the birth plans and expectations of women in Hebden Bridge versus those of women in sub-Saharan Africa (following my work with Liverpool School of Tropical Medicine); and produced a poem to encapsulate all the speakers contributions to a truly international day of insight and discussion. Last year, I ran sessions on 'Don't Forget You're Human' (including dealing with stillbirths), and then a session on 'Giving Birth To Creativity: Inspired Midwives' - together we explored birth stories creatively using poetry, photo slideshows, drawing, music, colour, and journal keeping. Char March was unbelievably funny and very interesting. Char March is like a force of nature! Char March – very uplifting! Char March – thought provoking and re-energised the room – very funny!! Enjoyed Char March – Good idea to inject a bit of ‘comedy’ into the day. It was nice to have Char March add creativity and humour. Very interesting fun and motivating. Guest speakers were excellent. A fantastic day, that I thoroughly enjoyed. Once again thank you for your contribution and for making the day the success it was. The midwifery team who organised and ran the conference - me 2nd from left.